Click here for information on alternative loans. Click here for information on direct subsidized/unsubsidized loans. Please note: Students must be registered for a minimum of 6 credits per semester in order to qualify for a Federal Direct Stafford Student Loan. A total of 6 credits combined in a semester (i.e.-being enrolled for 2, 3-credit module courses in a standard term or for two 3-credit summer sessions courses over the entire summer) will suffice. Program Description Loans made to eligible undergraduate students who demonstrate financial need to help cover the costs of higher education at a college or career school. Loans made to eligible undergraduate, graduate, and professional students, but in this case, the student does not have to demonstrate financial need to be eligible for the loan Loans made to graduate or professional students and parents of dependent undergraduate students to help pay for education expenses not covered by other financial aid. Loans you can obtain from banks, credit unions or other lending institutions to help cover college expenses not met by scholarships, grants, federal loans or other types of financial assistance. Fixed at 6.60% for the 2018-19 academic year Fixed at 7.60% for the 2018-19 academic year Varies by Lender and Borrower Credit. *Note: 2018-2019 academic year rates apply to loans with first disbursements on or after July 1, 2018 through June 30, 2019. Click here for information on PLUS loans. Students must be enrolled for a minimum of 6 credits/semester in order to be considered for the Federal Direct PLUS/GradPLUS Loan. As a service to our students and families, Saint Joseph’s University provides a historical list of lenders our students have successfully borrowed with over the past several years. Click here for Private Education Loan Information. Students and families have the right and ability to select the education loan provider of their choice, are not required to use any of the lenders current students utilize, and will not be penalized for choosing another lender. Saint Joseph’s University will process a loan with any lender a borrower chooses. Once a loan has been approved, it is the student’s responsibility to notify the Office of Financial Aid with the lender information. Please feel free to contact The Office of Financial Aid if you have any questions. Click here for Private Education Loan Information. What is SJU’s Code of Conduct for Education Loans? In the administration of its student financial assistance programs Saint Joseph’s University (SJU) abides by the National Association of Student Financial Aid Administrators (NASFAA) Statement of Ethical Principles. In addition, Saint Joseph’s University has adopted a Code of Conduct for Financial Aid which can be found below. Saint Joseph’s University shall not assign any first-time borrower’s education loans, through award packaging or other methods, to a particular lender. Saint Joseph’s University shall not refuse to certify, or delay certification of, any loan based on the borrower’s selection of a particular lender or guaranty agency. No officer, employee or agent of Saint Joseph’s University shall solicit or accept any “gift” from a lender, guarantor, or servicer of education loans. “Gift” includes any gratuity, favor, discount, entertainment, hospitality, loan or other item having monetary value of more than a de minimus amount. This prohibition also applies to gifts to family members of the above individuals when the gift was given with the knowledge and acquiescence of such individual and the individual has reason to believe the gift was given because of such individual’s official position. Saint Joseph’s University will not enter into any “revenue-sharing arrangement” with any lender. A “revenue sharing arrangement” is an arrangement whereby the University recommends a lender of educational loans, and then in exchange, the lender pays a fee or provides other material benefits, including revenue or profit-sharing, to the University, or an officer, employee or agent of the University. No officer or employee of Saint Joseph’s University who is employed in the Office of Financial Aid of the University or otherwise has responsibilities with respect to education loans, or an agent who has responsibilities with respect to education loans, shall accept from any lender or affiliate of any lender any fee, payment or other financial benefit (including the opportunity to purchase stock) as compensation for any type of consulting arrangement or other contract to provide services to a lender or on behalf of a lender relating to education loans. Saint Joseph’s University shall not request or accept from any lender any offer of funds to be used for private education loans for students, including funds for an “opportunity pool loan,” in exchange for the institution providing concessions or promises to provide the lender with: (i) a specified number of loans made, insured or guaranteed; (ii) a specified loan volume; or (iii) a preferred lender arrangement. An “opportunity pool loan” means a private education loan made by a lender to a student attending the University or a family member of the student, that involves a payment, directly or indirectly, by the University of points, premiums, additional interest, or financial support to the lender for the purpose of the lender extending credit to the student or the student’s family. Saint Joseph’s University shall not request or accept from any lender any assistance with call center staffing or financial services office staffing. However, this prohibition does not preclude requesting or accepting assistance from a lender related to: (i) professional development training for financial aid administrators; (ii) providing educational counseling, financial literacy or debt management materials to borrowers that identify the lender who assisted in preparing or providing the materials; or (ii) staffing services on a short term, nonrecurring basis to assist the University with financial aid-related functions during emergencies. No employee who is employed in Saint Joseph’s University’s Office of Financial Aid, or who otherwise has responsibilities with respect to education loans or other student financial aid of the University, and who serves on an advisory board, commission, or group of lenders or guarantors, shall be permitted to receive anything of value from the lender, guarantor, or group of lenders or guarantors, except for reimbursement for reasonable expenses incurred in serving on such advisory board, commission, or group. What Loan Options are Available to Students at SJU? To help our students finance a Saint Joseph´s University education, we are pleased to be able to offer several loan options. Students are encouraged to review the options to determine which is best suited for their specific needs. Please note: Students must be registered for a minimum of 6 credits per semester in order to qualify for a Federal Direct Stafford Student Loan. A total of 6 credits combined in a semester (i.e.-being enrolled for 2, 3-credit module courses in a standard term or for two 3-credit summer sessions courses over the entire summer) will suffice. Undergraduate students will be awarded federal loans based on federal guidelines. Graduate students are no longer eligible to receive the Federal Direct Subsidized Loan effective on or after July 1, 2015. Graduate students in a Masters Program may be eligible for up to $20,500 in Federal Direct Unsubsidized Loans. Students MUST be registered for a minimum of 6 credits per semester in order to be eligible for a Federal Direct Loan. (6 credits total over two modules in a single semester or 6 credits total over two summer sessions combined suffices). Graduate students in a Certificate Program may be eligible for up to $12,500. Below are descriptions of the loan programs available to help determine the amount of financing a student may require. Click here to find more information about Federal Direct Unsubsidized Loans for Graduate Students. 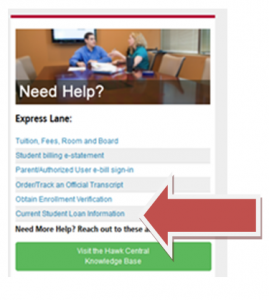 Select “Current Student Loan Information” in the Express lane. This will take you to The National Student Clearinghouse website. Select the Loan Locator option to view the specifics about your student loans. Use this tool, provided by the U.S. Department of Education, to determine your eligibility for federal student loan forgiveness based on public service.